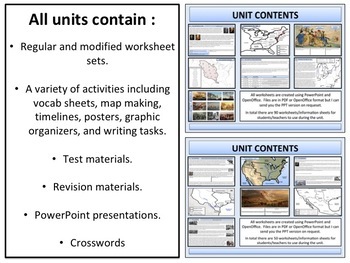 Activities included in the units include graphic organizers, maps, timelines, writing tasks, posters, and vocab sheets. Please see the preview sheet for examples of the resources. Colonial America - "Another great unit! Mr. Gray knows his stuff! 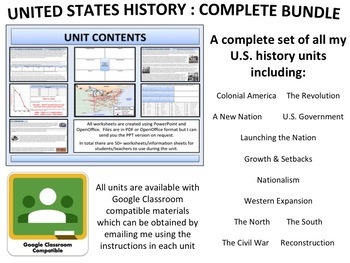 I'm teaching an 8th grade US history class for one year, and this is saving me lots of time! My students are learning a lot, too! THANKS!" The War of Independence - "The kids loved this lesson. Even thought by 7th grade they have learned about this a million times, this time they told me they really understood and they all did very well on the test. Love this!" 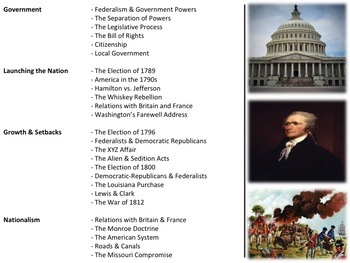 New Nation - "I am currently using this with my 8th grade US History class. I love the reading/writing/thinking and discussion that is encouraged by the powerpoints. Great pictures and video clips keep the students engaged." U.S. Government - "I decided to spend more time teaching your first 4 units on US Government this year because of our present political environment. It was wonderful to see my 8th graders understand our democratic processes. Great lesson, thoughtful questions and hands-on activities. Thank you!" Launching the Nation - "Great unit… when we get to the questions slide I offer candy to the kids who can answer the questions. It keeps them SUPER focused and they tell me they love social studies! :)"
Growth & Setbacks - "AMAZING!! Perfect for my 8th grade history class. 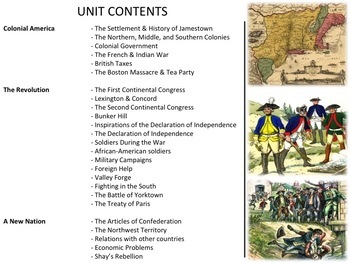 The unit includes informational text followed by common core based questions, an alternate version of the notes and organizers for differentiated assignments. I am not one to give homework, however, I will use the hw activities included in this unit because they reinforce information in a way that is visual and hands on where I think students will not mind doing hw. PPTs are amazing...non cluttered, simple and to the point with embedded video clips and political cartoons. I will be buying all relative units with great appreciation for the time I will save." Nationalism - "These units do all of the work for me-- creative powerpoints, thoughtful homework/classwork assignments = one great unit after another!" Western Expanison - "I love your resource and use it in my class! My students truly understand this because of how you organized it. Thanks!!!" The North - " I have purchased several of Patrick Gray's units. They are complete and aligned with California content standards. I like that there is a thought provoking question in each lesson section. And, the powerpoints are magnificient!" The South - "After using the North unit with great success, I'm looking forward to teaching this with great discussions. Thanks!" The Civil War - "My squarely 8th graders LOVED this lesson. Everyone (yes EVERYONE) watched and were completely engaged. They are excited and look forward to social studies every day! I'm going to be sad when this unit is over! Totally worth every penny!" Reconstruction - "I have purchased many of the units from this seller and every one of these have been great. This one is no exception. My students love the PowerPoints and worksheets"